An Iranian aid ship headed toward Yemen and flanked by two warships will stop at Djibouti for international inspection, diminishing the risk of a showdown with the Saudi- led military coalition blockading Yemeni ports. The vessel will be inspected by the United Nations at Djibouti, less than 20 miles across the Gulf of Aden from Yemen, Fars news agency reported, citing its reporter on board. 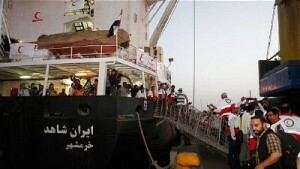 It will then continue its course onto the Yemen’s Red Sea port of Hodeidah as initially planned, it said. Saudi Arabia is leading a coalition carrying out airstrikes against the Shiite Houthi rebels in Yemen and accuses Iran of supporting the group. The crisis has raised tension between Saudi Arabia and the Islamic Republic as they jockey for regional influence. The UN says at least 1,800 have been killed in Yemen since the conflict escalated in March. Iran says the ship carries 2,400 tons of food and 100 tons of medicines. –With assistance from David Lerman in Washington.